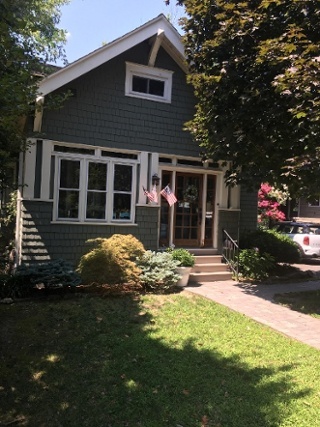 Interior Renovation of Home in Collingswood | R. Craig Lord Construction Co.
An R. Craig Lord Construction Company interior renovation has begun in Collingswood NJ. This historic home is undergoing renovations for a new Kitchen, two Baths, and a closet for the master suite. 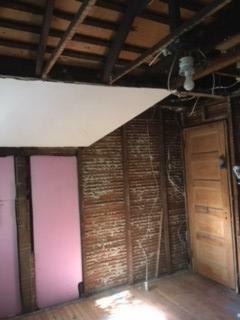 The renovations will provide the homeowners with an open layout that balances new design features with period charm. The Kitchen has been gutted to the lathe and framed so that ½” drywall can be installed to create a flat surface for the new cabinets to be installed. A new expanded entryway has been created by removing the wall between two rooms and creating an open flow between the Kitchen and Dining room with an expanded entryway. The new sightlines created will allow views from the back of the house to the front. 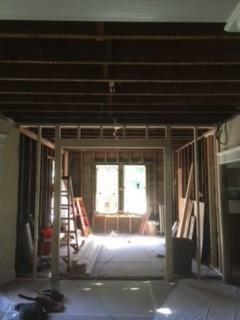 The Master Suite Closet is being renovated to create a functional walk-in closet. This picture shows the renovation in progress and additional insulation installed to storage spaces. The first Bathroom renovation is starting as well. Keep checking back for behind-the-scenes updates of the work in progress. R. Craig Lord Construction Company is located in Moorestown, NJ and offers in-home consultations. Feel free to give us a call at (856) 235-4237 or contact us online at www.rcraiglord.com to discuss your project needs.